Calvin Griffin, a native of Columbus, Ohio, had a busy 2017 - 2018 season, making exciting debuts with Atlanta Opera as Mother in _The Seven Deadly Sins_ as well as Morales in Carmen, Opera Birmingham singing Escamillo in Carmen, Opera on the James as Leporello in Don Giovanni, Opera Orlando singing Alidoro in La Cenerentola, and returned to Arizona Opera to sing Dr. Bartolo in Il barbiere di Siviglia. 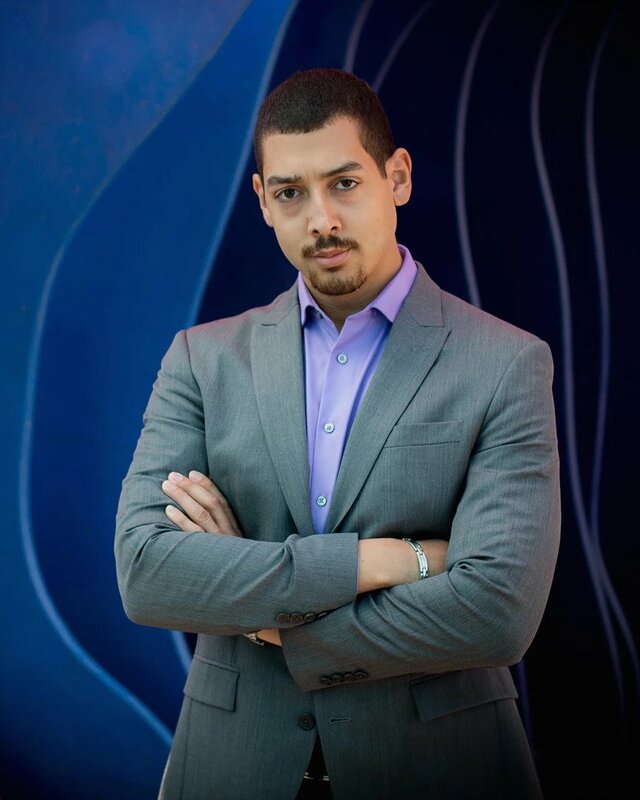 In the 2016-2017 season, Mr. Griffin was a member of the Florida Grand Opera Studio, where he made his debut with the company stepping in as a cover to sing the role of Escamillo in Carmen. Additionally, he sang Zaretsky and covered Gremin in Eugene Onegin, sang Victor in Before Night Falls, and Samuel in _Un ballo in maschera_ with the company. He recently finished a stint with the Arizona Opera Studio where he performed the roles of the Captain in Florencia en el Amazonas, Zuniga in Carmen, Pistola in Falstaff, Count Ceprano in Rigoletto, Zaretsky in Eugene Onegin, Speaker/2nd Armored Man in Die Zauberflöte, Hortensius in La fille du régiment, Colline in _La bohème,_ and Dr. Grenville in La traviata. In 2016, he made his Opera Columbus debut as Colline in La bohème. In the 2018-2019 season, he is excited to cover Zuniga in Dallas Opera’s production of Carmen, return to Florida Grand Opera to sing the title role in Le nozze di Figaro, and sing Eddie in Minnesota Opera’s production of The Fix. Last summer, Mr. Griffin made his debut with Minnesota Opera in their production of Fellow Travelers. Previously, he participated in the Glimmerglass Festival where he sang Elviro in Xerxes, Undertaker in Porgy and Bess, Fabrizio and covered Gottardo in _La gazza ladra,_ and covered the title role in Sweeney Todd. In 2015, Mr. Griffin returned as an Apprentice Artist to Santa Fe Opera where his assignments included Count Ceprano in _Rigoletto_ and Hortensius in La fille du régiment. Mr. Griffin sang the title role in _Gianni Schicchi_ at the Aspen Music Festival, and he covered the role of Leporello in _Don Giovanni_ as an Apprentice Artist at Des Moines Metro Opera. He was a Studio Artist at The Wolf Trap Opera Company, as well as a participant at the Brevard Music Festival. In concert, Mr. Griffin returns this season to the Richmond Symphony as the bass soloist in Handel’s Messiah, and as soloist in Opera Columbus’ _Opera Swings Jazz_ concert. He made his Houston Symphony debut as First Apprentice in the Grammy Award winning production of Wozzeck. Other solo performances include Bach’s _B Minor Mass_ with Choral Arts Sarasota, and the baritone solos in Brahms’s _Ein deutsches Requiem_ at The Ohio State University, as well as Worthington United Methodist Church. In competition, Mr. Griffin won 1st Place in the 2017 Dorothy Lincoln Smith Voice Competition. He was the 2015 winner of the Igor Gorin Memorial Award, was awarded a Western Region Metropolitan Opera National Council Auditions Encouragement Award in 2014, 1st Place winner in the 2012 Tuesday Musical Club Competition in San Antonio, 1st Place winner in the 2011 Hal Leonard Vocal Competition, and was awarded a Central Region Metropolitan Opera National Council Auditions Encouragement Award in 2010. He was also a winner in the Cincinnati College-Conservatory’s Corbett Competition and was awarded the Linda Candler Award at the Brevard Music Center. Mr. Griffin received his Master’s Degree in Vocal Performance from Rice University’s Shepherd School of Music under the tutelage of Dr. Stephen King. At The Shepherd School, he was seen in the title role of the Houston premiere of John Musto’s Volpone. Additionally, he performed the roles of Don Alfonso in _Così fan tutte_ and Polinesso in Ariodante. Mr. Griffin received his Bachelor’s Degree from The Ohio State University where he performed the roles of Superintendent Budd in Albert Herring, Bartolo in Le nozze di Figaro, and Gustavo in Faramondo.